“I’d like to make quite clear that we’re not here to argue. We very much want to move towards a resolution to this issue. Indeed, his stance was calm and reasonable. However, beside him on the table was a book entitled The False Dalai Lama: The Worst Dictator in the Modern World. How could the Dalai Lama ever have dialogue with people who write such things? In my mind, much of this dispute rests on the fact that many within the organized (rather fanatic) Shugden community have now demoted His Holiness from any position of religious or spiritual authority at all. Given that the Dalai Lama’s stance regarding Shugden worship is based on him fulfilling his responsibility and duty as a religious leader, dialogue seems pointless. He made his points about Shugden, but insists that people should not follow him without investigating this issue and its 400 years of history thoroughly. He also states that its up to the individual to accept or to reject his advice. Shugden people can practice Shugden, Rabten can practice it. They have their own monasteries, their own places, but there are restrictions on the institutional level. So their rights to practice are met. However they cannot practice at places where the majority of the community decided against it– by a procedure laid down in the Vinaya (monastic code of discipline) by the Buddha. This is comparable to prohibiting smoking in public places because it harms the non smoker. So, the real point of difference is not about the rights of Shugden worshippers, but about the Dalai Lama’s right advice and the right of people to follow his advice and to decide against smoking (Shugden worship) at public places —and that’s a different topic entirely! Further, if Shugden worshippers see hidden agendas behind everything the Dalai Lama’s says and won’t take his words on face value, what is the point of speaking with him? They will come to their own conclusions regardless of what he says! Further, to call the person whom you claim to seek dialogue with a liar, evil and cruel, ruthless dictator, worst dictator of the modern world—is this a basis for a dialogue? Are Kelsang Rabten and NKT, or the organised Shugden fanatics, really willing to listen to anyone’s point of view but their own in dialogue? In addition, how can there be dialogue while there is still so much deceit? I have found evidence of fifteen incidents of deception just in a few videos on the International Shugden Community (ISC) website—fifteen and I’m still counting. (see here) Some of these are unsubstantiated claims and some can only be called outright lies. This was the problem Tibetans encountered with the Chinese, where finally dialogue was proven to be fruitless. In my view, the only dialogue that would be worth having in this situation would be regarding living conditions of Shugden worshippers in India. These would include the claims that Shugden worshippers aren’t given basic services, community membership or proper housing and are subjected to violence. The Indian legal system and the Tibetan Government in Exile could be part of these dialogues—and the Dalai Lama’s presence wouldn’t be needed at all. However, in view of the impossible demands Rabten makes at the end of his SOAS talk, such a constructive approach is clearly not what he is advocating. Sometimes it even seems as if the ISC is more interested in harming the Dalai Lama than in helping Shugden worshippers in India. Tibetan Buddhism. In this way he can easily control the spiritual life of all practitioners of Tibetan Buddhism. I know this is his wish; he has been working towards this for many years. Once again, how can there be dialogue if this is Kelsang Gyatso’s impression of who the Dalai Lama is? And how can there be dialogue if protesters are willing to go so far in their smear campaign as to hold insulting placards, depicting a revered teacher of Dharma, a fully ordained monk in robes in mocking caricature? How can there be dialogue until the weapons are withdrawn? To allow anyone who wishes to practice Dorje Shugden the freedom to do so. To stop completely the discrimination against Shugden practitioners. To allow all Shugden monks and nuns who have been expelled to return to their monasteries and nunneries. And to receive the same spiritual and material rights as non-shugden practitioners. To write to Tibetan communities throughout the world telling them that they should apply practically the above three points. The moment this happens, all our demonstrations will finish. I don’t think any of those requests are unreasonable. We simply want these people to have genuine and complete religious freedom. If that happens, all of our protesting will finish. This is not a statement for dialogue; it is an ultimatum. Rabten repeats several times that if the demands are met, “protests will finish.” Rabten needs to understand first that the Dalai Lama cannot over rule the majority vote of the monks in the monasteries, who decided democratically, and based on the Buddha’s Vinaya, to separate from Shugden monks. If the Dalai Lama were to force the monasteries to go against their majority vote this would be an act of a dictator. On the other hand, His Holiness was clear: whatever the outcome of the vote is, also if it is pro Shudgen, he would definitely accept it. Now the NKT/ICS/Shugdenists should accept the rights of the majority and practice at their own places—which they can do freely. Rabten also demonstrates his complete lack of understanding as to what followers of the Dalai Lama “care about.” This is not about “the Dalai Lama’s image and reputation.” Rabten’s is a jaded viewpoint regarding sincere students and followers of the Dalai Lama—who see his message as a world treasure. Let me say to Rabten clearly: The Dalai Lama can take care of himself. His image and reputation are only important as tools towards fulfilling his life’s work. Beyond that, they have no role or importance. And I would also remind Rabten that everywhere the Dalai Lama goes, people gather in the thousands and continue to be inspired to become more caring, decent human beings. Many people are so deeply moved by his words and presence that they start to weep – no matter what background, be they criminal, atheist, Christian or Muslim, scientist or old lady. A few small bands of protesters have barely scratched the surface of his popularity or his work to make the world a better place. Recently, when he was in Ladakh, 140,00- 200,000 attendees came to hear him teach and give an empowerment. The countryside was a sea of attendees. Rabten’s last words sounded to me like a threat from a man who imagines he has more power than he possesses. He imagines that the protests and the smears will force the Dalai Lama to change his mind. At the same time, he calls for dialogue! I fear he has little understanding of the situation. He fails to understand that the Dalai Lama spent years of investigation, reflection and contemplation regarding the issue of Shugden worship before he came to the difficult decision to restrict this practice. He is not going to change that because of a few people shouting themselves hoarse outside his events! He has said on different occasions that he has done his research expressed the results and now it is up to others to do their own unbiased, open research into the 400 years of Shugden worship. From my own point of view, watching the aggressive faces or the dancing, hypnotic hilarity, or the robotic repetitions of protesters—or listening to accounts from X-NKT students—I have only gained a greater conviction that the Dalai Lama’s decision was the right and wise one. By its results, particularly within the NKT, Shugden worship appears like a dangerous, cult practice to me. The Dalai Lama is clearly protecting the Buddha Dharma by restricting it. How can there be dialogue while Shugden worshippers behave in these ways? His Holiness replied, “Good question.” and proceeded to answer. His Holiness then attempted to explain that as a Buddhist monk, he was committed to telling the truth. Whereupon the questioner continued to shout loudly, “Stop lying, stop lying, stop lying.” He had a microphone, so it was quite loud! This man was ultimately asked to leave by security and we could hear him shouting his slogan off in the distance as he was escorted out of the venue. Is this what Rabten and the ISC/NKT mean by dialogue? Have the ISC Changed Their Minds? Once and For All, What is the Real Reason For Their Claim the Dalai Lama is Lying? Well said Joanne. I used a stronger term than “ultimatum” I called it “blackmailing”. Its contradictory to claim to seek dialogue and to attack the person (whom you claim to approach for a dialogue) an evil and cruel person, a liar etc, all of the time, since almost 20 years. Even if the US government seek dialogue with true dictators they wouldn’t run such a campaign because it makes dialogue impossible. However, also Rabten can awake, may he awake! He could use his rhetoric talents and energy for reasonable and truthful things. This people just dont seek any truth. Not in their claims, not in the Buddhadharma, not in themselves. What they are doing is to express their confusion. But its good to find so many argument here, showing how substanceless their claims are. Since there are many people who are willing to follow such superficial lies about HHDL, it can help some of those people, when they can understand how easily one is manipulated to follow such protests. I live in Germany, since a couple of years, they have a term, a expression “Wutbürger”. I see it like one has emotions as anger, hatred and so on enough to become “active”, one search for a cause to engage in. In case on applies Buddhadharma to oneself, one day everybody meets a point where we have to be straight with ourself, even on a psychological level. As long one is not able to be honest with oneself, one is not able to discuss in a open way with others. Thats why it is very hard to communicate to such people. They need love, love love……, and a big big meadow to play on. But then, there is so much energy put in powergames and so on, all kind of the stuff we human beings maintain permanently, as long as we are in state of delusion. One person mentioned in this blog the book of Sam van Schaik, the history of Tibet. Recently I read it again. So much delusion even in Tibet……….., so it seems to me very logical, that such an old conflict appears in the west as well, since all phenomenons that convoy Buddhadharma in Tibet, chaperone it in the west now. Its not something new, just a “imported good”. I totally agree. HONESTY IS THE KEY. HONESTY IS THE WAY. HONESTY PROTECTS YOU. But honesty needs also inner strentgh! 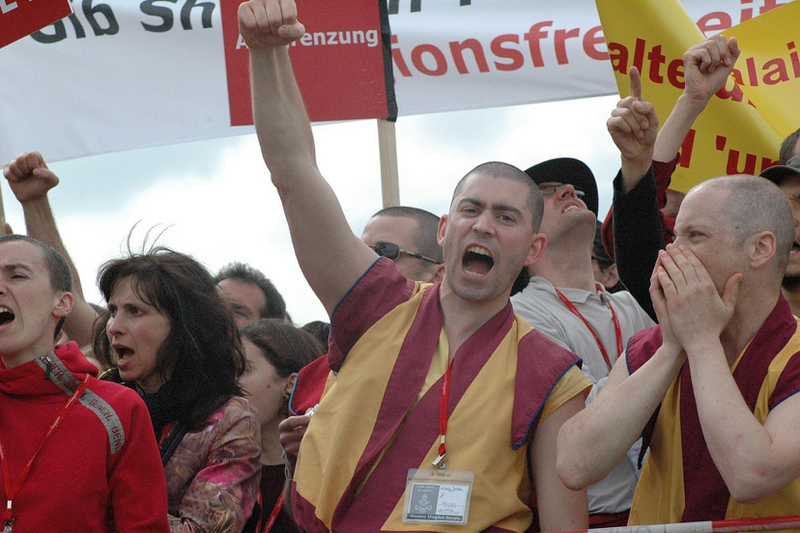 Stop Kelsang Gyatso’s ban on traditional Gelug protectors. Joanne, the argument is even simpler. Monasteries are private institutions just like NKT centers. Joanne, don’t try to argue against an active cult follower who is clearly expressing a psychiatrically relevant level of denial about something. This is a really really confused person. And in a way the only thing one can do is kind of ignoring the folly just like you would do with a kid or drunk that is babbling nonsense. Because, in the end, come on, it’s prettry irrelevant what they do. They are just so loud and obnoxious because they themselves know that what they do doesn’t really affect the masses as they wish it would. It’s a bit like the kids ugly tantrum in the supermarket. Have patience, it’s like a phase of defiance, in (more or less) time it will pass. I think Joanne is not trying to argue against Rabten. She is investigating his arguments and call for dialogue – an investigation I consider to be very useful. People who lack a good background understanding might really follow Rabten’s agrument on dialogue and think: “yes, why didn’t the Dalai Lama pick up on dialogue?” The question was also addressed to me. Instead of attacking Rabten as a cult follower which achieves nothing but hostility and putting down others “expressing a psychiatrically relevant level of denial” it should be reasonably been argued or just been silent. Joanne argues reasonably, and that’s why I put her post on the blog. Its about UNDERSTANDING, making up your own mind. I think this is useful. The NKT Shugden protesters are seriously suffering. The suffering is based on misunderstandings. Misunderstandings can only be overcome by offering a better understanding. Even if most of the NKT protesters won’t listen to any other understanding, there might be some, and the “some” can include even front men like Rabten. If we trample over them like if they were of no value who can help them out of a lack of understanding? I feel close to Rabten because I was in a similar situation as he is and I could have ended up in a situation where he is. But since the distortions are not based on reality, also Rabten can wake up. So that’s why, without a missionary drive, without hostility, not rejecting, clinging or ignoring them, it is very useful to provide good information and reflections. They are human beings as everybody and they deserves as every body understanding, compassion and the intention to be helped. Being helped to leave this confused state behind by for instance a good analysis about the validity or reasons being used. It is not about black and white, cult or or non cults. because it might not be true for all and it might only be true for a giving, changing point of time. However, the question is of course, how seriously do we take this and how much we allow it to dominate our life. This is a worthwhile question. However, I wouldn’t put down the effort of a person like Joanne, to build a bridge for those who are reachable for good reasons and common sense. You never know who will or if there is any body being benefited by such a post. If it benefits just one person, in my eyes this would be GREAT! As I know you, I wonder, why are you putting effort in this issue but put down the efforts of Joanne? I cannot really understand this. Yes, Tenzin, and I continue to be astonished at how blatantly the ISC distorts the truth on their webpage. It’s a vendetta. I just checked through the video entitled The Dalai Lama Lies About Advice From His Teacher and it is outrageous, really outrageous. I felt like it was addressed to three year olds and it was pure deceit. They have no shame. Triumphant’s offspring never will generate anything negative. Rather, their positive actions naturally increase. In that light it is really amazing to see and to acknowledge that HH the Dalai Lama in those years of protests against him with these vile attacks NEVER ever said anything bad about the protesters, the NKT or Kelsang Gyatso. Never, you won’t find any quote by him expressing something negative about the protesters, the NKT or Kelsang Gyatso. This is really amazing! Thank you for your work to point out the deceptions (I lack time but think for some people this will be of benefit). I linked four of your articles from your blog in the post. These British people interfering in Eastern cultures is just colonialism. Referring to NKT British people here. Does anyone have further information on America viewing Dolgyalpas as a security threat? I feel many of the NKT people embraced their alter-egos at too young an age. For example, Kelsang Norden was ordained at 18. Adopting the whole NKT package: a new name, a new haircut, and new content with which to fill your mind may provide some sense of relief and escape from self-loathing. However it seems basic education in basic western values of democracy is conspicuous by its absence: sorry to repeat myself but in the parliamentary system, one does not call others ‘liar’–as Tenpel pointed out–this is not conducive to dialogue. I’ve seen better faith and sensitivity on the part of the Palestinian Authority, who this spring issued a sincere statement commemorating the Holocaust with respect to their neighbors, Israel. Any Kadampa worth the name needs to have more empathy, manners and wisdom like that: did NKT delete the parts about thinking of others? NKT ordination is not legitimate. We should not use the word ordain. It is a valid Rabjung ordination. Go to Dharma Wheel. I’m sure many smart people would disagree with you. There’s a Tibetan saying I heard once– if you give room for a needle, it will gradually take more and more. Once we give ourselves permission to do one negative thing, the next looks easier and so on– those poor fellow human beings out there shouting while others study the Dharma are definitely on a very slippery slope. As Tenzin says, we can only pray for them..And I do think pressure is needed as well. Day after day, simply keep exposing them to themselves, keep the pressure on. But also, this morning, listening to His Holiness teach, seeing how calm he stays and how unwavering he remains to his main purpose, I remembered how important it is to keep balanced. If their actions cause us to get stirred up or agitated, then that damages ourselves, and everyone else. We owe it to HH to stay calm and true to our Dharma practice. So that’s my reminder for the day. Yesterday, when I saw that huge banner blaspheming HH who was praying in a Muslim hat, I got really upset. Probably because I value his interfaith work so highly. It just felt terrible. But I realized today that I either stay calm and confident– or avoid this business altogether, stop looking at ISC websites etc. I’ve decided to stay calm. After seeing tge NKT’s behaviour today, in particular that if the robotic and abusive man who wouldn’t even let HH answer his ridiculous Shugden question without screaming “liar”, I am starting to think dialogue with such fundamentalists is impossible. He had no problem ruining a special day for thousands of Tibetans who lost everything. While he goes home with a passport and free medical care. A white man who has never really experienced oppression, interfering in a culture about which he understands nothing. Misdirected colonialist sentiment from NKT. It was also sad for the man and the NKT/ICS. The man came across like one of those fundamentalist Christians, that tell you you go to hell if you don’t open up for god. This type of behavior is so poor, sad and ridiculous that it makes the person himself a fool and an object of compassion. The NKT/ICS could have used those opportunities, where they shouted liar or false Dalai Lama to the Dalai Lama, to really have a dialogue by asking reasonable questions but dialogue is not their aim though they pretend so. What was amazing was the response of HH the Dalai Lama. As he never ever said anything bad about NKT, Kelsang Gyatso or the protesters, rather insisting that he is very happy that they can enjoy freedom of speech and also a holiday at the costs of NKT (they can travel around the world with free food and free accommodation and bus rides etc. ), he was also at that occasion – when he was accused to have “broken with your root guru” (= you go to hell for that) and and to be liar – totally cool, calm and relaxed. When he realized that the person is not capable for a dialogue/Q&A he just stopped to answer and moved to the next question. They come off as European colonialists. Yes, Tenzin, and at the end of the day, it became a teaching for attendees– and a deep shame on the NKT/ISC. I felt very inspired watching HH handle the situation– and very sad to hear the Tibetan monk who spoke later with such emotion. The NKT/ISC keep crossing lines of basic decency…. National Human Rights Commission on Shugden??? The smartest person at the SOAS conference was the Anthropologist who basically said that ‘it’s all a matter of cultural opinion’ and that none of these things are real. he, for me is the truly enlightened being! Martin Mills was really the best. It was great that he used the second part to finish his talk. He was truly also the highlight for me. Note that his two papers about Shugden are online.